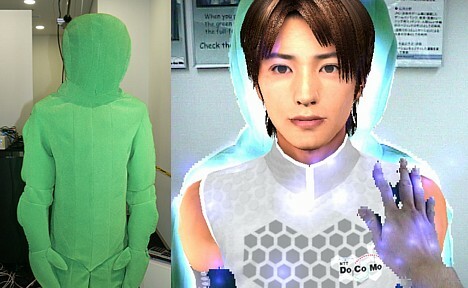 U-Tsu-Shi-O-Mi is a "mixed reality" (or augmented reality) set-up that uses an otherwise featureless humanoid robot as a substrate. This prototype, created by Michihiko Shoji at Yokohama National University Venture Business Laboratory, is disturbing at a very deep level. U-Tsu-Shi-O-Mi is part of a system that employs computer animation viewed through a special headset. When you put the headset on, you see a beautiful person "painted on" the featureless robot. When the robot moves, for example, to shake your hand, the computer animation "sticks" to the robot and looks continuous to you. Shoji sees arcade-style applications, but is looking for ways to reduce the cost and make it suitable for general household use. So, if I got one of these, I could look at it as a maid for a while, and then switch programs and see it as a cook, and so on. If you want to see the logical endpoint of augmented reality, take a look at the smart contact lenses of Vernor Vinge's 2006 book Rainbows End, which take the place of the bulky headset in the U-Tsu-Shi-O-Mi system. With the smart contact lenses in place, the user selects from any of a number of applications, which allow him to (for example) look at an ordinary city street, and see it covered with Christmas decorations. Or to look at a person, and see what that person would look like with a beard, or with a different set of clothes. The images on the lenses are superimposed on the real-world scene. Augmented reality research is ongoing, but so far very few applications really meet its main objectives of combining the real and virtual worlds in a single, interactive, three-dimensional reality. But, as long as you're into it, take a look at Augmented Reality Shopping In Osaka and even take an Augmented Reality Cemetary Tour - The Dead Speak.